I feel like this little one today. I’m tired and I want someone to carry me. 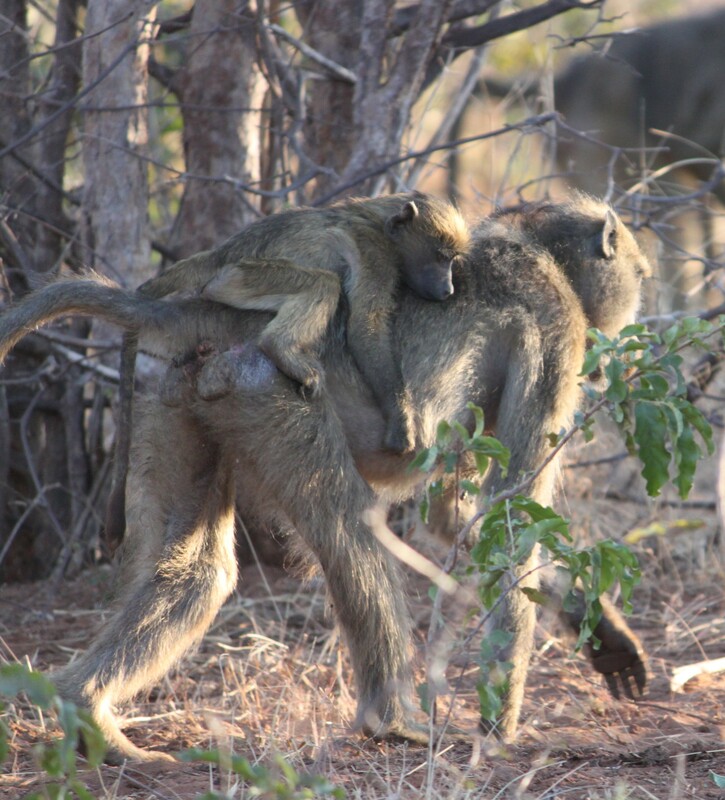 This entry was posted in Travel Photos and tagged 50 Year Project, A Mother's love, Africa, Baboons, Baby Animals, Blog, Blogging, Botswana, Chobe National Park, Exhaustion, Life, Love, Moms, Photography, Support, Tired, Travel, Travel Blog, Travel Journal, Travel Photo, Wildlife. Bookmark the permalink. Friday tomorrow then the weekend – feet up! Love that picture. Such a lovely shot of a caring family. I learn so much from animals and how they take care of each other. Thanks Robin. I can feel the love and protection. It does have that feel. Can’t help but smile when I see it. Awww, that’s adorable! Can you go back there and get me a monkey? I’ve always wanted a monkey for a pet :). Not sure they would take too kindly to that. We had to keep our tent zipped up tight since they are busy little creatures. We saw many in cars and the cars didn’t fare too well. Since you are a neat freak, you may not like it. Organization would fly out the window–literally. Ok, forget that idea LOL!! I don’t want anybody or anything messing with my organization. I have enough trouble with the hubby and the kids :). Wait till I visit. You won’t even know what hit you. I’m not telling you what else she did. I don’t want to give you any more evil ideas LOL!!! Evil ideas. I’ll ask Mike. I’m sure he would know the best way to annoy the heck out of you. All done for fun, of course. Oh trust me, he knows EVERY way to annoy me, and he practices his methods every day :). Here, I’ll let you in on one of them. I can’t stand when people don’t close drawers and cupboard doors, so every morning when he is getting dressed he purposely leaves each of the drawers in his dresser open about an inch and the closet door open as well. I still love him though :). Funny, mine does the same thing. Does Mike know how to use a laundry basket? We are still working on that skill here. Mike is not allowed to touch the laundry because he doesn’t believe in separating lights and darks. He would just throw everything in together LOL!! The only time he did laundry was when I went to England and the Netherlands with Bryan, and I typed out 3 pages of detailed step-by-step (organized) notes for him. No seriously, I’m sure he would be just fine doing laundry but why take any chances right? LOL! He makes up for not helping with the laundry by doing the lion’s share of the cooking, and I hate cooking so it works out just fine. On a side note, Bryan insists on doing his own laundry at college and has never brought any home for me to do even though I have offered. I’ve had a very good influence on him I think :). 3 pages of detailed notes–do you still have them? I’m not sure I could come up with 3 pages. Good for Bryan–I wasn’t as kind. Ooops! My better half does most of the cooking as well. No one wants to eat food I’ve cooked. Trust me. Being organized like I am (LOL), I do believe that the notes are still sitting on the shelf above the washing machine :). Any chance you can post them or email them? I have a feeling I might get a few chuckles. You two are sooooooooooo funny. Sorry, I was got so busy at work I never had a chance to get back to you TBM. So, I have to know, do you want my laundry instructions to laugh at me or to laugh at my hubby for needing them?? LOL And Jo, I’m glad we could make you smile :). We are a little crazy but that makes us fun :). I want to laugh with both of you. Never at you. And I’m trying to figure out what I’m doing wrong with my laundry. There is no way I could come up with three pages of notes. I must be doing it wrong. Trust me, you really could come up with three pages if you were writing it for a man to understand. You know, open door, pick up clothing off floor, put clothing inside, close door. I didn’t want to miss a single step or I’m sure I would have heard, “well, you never told us that”. LOL!!!! Ya, that’s good eh? It was a big joke around my house when I did up those instructions. I didn’t want there to be any room for doubt :). Oh, I’m sure I could still screw it up. Sounds like a good challenge! You’re a woman! You couldn’t screw it up that bad could you?? OMG this is scary! I’d better go and look for those instructions right away :). I didn’t know I could screw it up, but your lists are suggesting that I don’t even know a third of it. Yes, I want to see the instructions. Isn’t that what the better half is there for? Better half took me out for Chinese and saved the day! So cute. They could be mistaken for humans, except for their hairy bodies.